United Airlines has introduced into international service its newly reconfigured Boeing 767-300 aircraft on trans-Atlantic flights. Last nights first flight of the newly equipped aircraft departed from Chicago to Amsterdam, as flight 908. This 767 aircraft now features flat-bed seats in an all-new United BusinessFirst cabin, along with an upgraded inflight entertainment system throughout. The aircraft is the first of 14 to get the new interior, offering 30 seats in United BusinessFirst, 49 in Economy Plus and 135 in Economy. In addition to flat-bed seats, United BusinessFirst offers a 15.4” touchscreen monitor delivering on-demand inflight audio/video content, electrical and USB outlets for charging electronic devices, an iPod jack enabling customers to play content from their iPod-compatible devices and a five-course meal with fine wines. United Economy Plus seats provide more legroom and more recline than Economy seats. Each Economy Plus and Economy seat features a 9” touch screen on-demand, inflight entertainment system and all Economy rows have access to electrical outlets. On long-haul international flights, United offers Economy Plus and Economy customers complimentary food, soft drinks, juices, tea and coffee. “We are committed to building an unsurpassed travel experience for our customers,” said Jim Compton, United’s executive vice president and chief revenue officer. In addition to the interior changes, this Boeing 767-300 now includes Winglets for improved fuel savings. Offering the largest fleet of aircraft with flat-bed seats among U.S. carriers. Nearly 150 United aircraft now offer flat-bed seats in premium cabins. 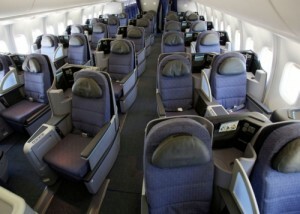 United is retrofitting more than 30 additional aircraft, scheduled for completion by early 2013. Expanding extra-legroom economy seating to provide the most such seating of any U.S. carrier. More than 550 United-operated aircraft offer Economy Plus seating, as do 150 larger United Express regional jets. United plans to expand Economy Plus availability to an additional 100 aircraft this year, including United’s two-cabin Boeing 777 aircraft, which are scheduled for completion this summer. Revamping the transcontinental p.s. fleet. United plans to replace the existing United First and United Business cabins with an all-new United BusinessFirst, modeled after the existing United First service, but also offering flat-bed seats and on-demand inflight audio/video content. The aircraft will feature an inflight entertainment system in individual seat-back monitors for Economy customers as well. Introducing inflight connectivity. United expects to introduce satellite-based Wi-Fi later in 2012. Improving inflight entertainment options on the Boeing 747-400 fleet. Beginning in the fourth quarter, United plans to offer Economy customers a selection of video programming available for wireless streaming.